Most Americans support the military’s decision to lift restrictions on women in combat. Two-thirds (66%) support allowing women in the military to serve in ground units that engage in close combat; just 26% are opposed. Majorities of nearly all demographic groups offer support for this. Notably, almost identical percentages of men (65%) and women (66%) support the change. About three-quarters of Democrats (76%) support allowing women in combat roles, as do 65% of independents. Republicans also favor the change in policy, but by a narrower 55%-37% margin. 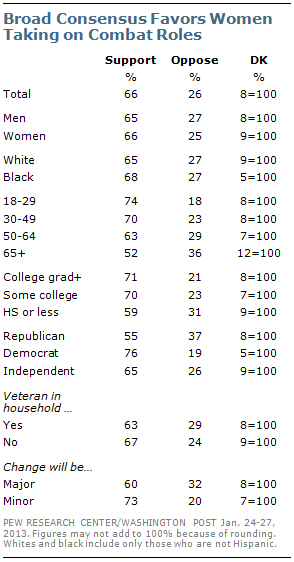 Older Americans are less supportive of the change in military policy than younger Americans. Among those 65 and older, 52% support the decision while 36% are opposed. By contrast, more than seven-in-ten of those younger than 50 (72%) support allowing women to serve in combat roles.